My review copy: Received from the publisher in exchange for an honest review. 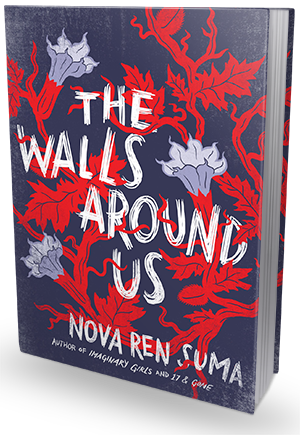 The Walls Around Us is a ghostly story of suspense told in two voices—one still living and one long dead. On the outside, there’s Violet, an eighteen-year-old dancer days away from the life of her dreams when something threatens to expose the shocking truth of her achievement. On the inside, within the walls of a girls’ juvenile detention center, there’s Amber, locked up for so long she can’t imagine freedom. Tying these two worlds together is Orianna, who holds the key to unlocking all the girls’ darkest mysteries. We hear Amber’s story and Violet’s, and through them Orianna’s, first from one angle, then from another, until gradually we begin to get the whole picture—which is not necessarily the one that either Amber or Violet wants us to see. Nova Ren Suma tells a supernatural tale of guilt and innocence, and what happens when one is mistaken for the other. We slept while it rained those of us who could sleep. We counted mistakes like sheep, those of us, like me, and like D'amour, who couldn't sleep. Maybe, long ago, we used to be good. Maybe all little girls are good in the beginning. There might even be pictures of us from those easy days, when we wore braids and colorful barrettes, and played in sandboxes and on swing sets, if we knew days so easy or wore such barrettes. There was a photo of me in a red-checked shirt and two braids at the neighborhood park. I had a raised shovel and had lost a tooth, but I smiled anyway. My mother used to have that photo in a frame. But something happened to us between then and now. Something threw sand in our eyes, ground it in, and we couldn't get it out. We still can't. It took me a long time to finish this book. Not because it was bad or boring or particularly slow-moving. No, not at all. It took me so long (almost a week) because it was so dark, thick, kind of depressing and also kind of confusing (in that "what in the world is going on here?" kind of way). I had to take it in small doses, otherwise I would've gone nuts. The plot line was so mysterious, so murky and fuzzy and all kinds of messed up, I just couldn't wrap my mind around it. Don't get me wrong, I loved it. I love well devised plots filled with secrets and darkness and twists, but Nova Ren Suma's stuff can really mess with your head in ways that are both addictive and lethal. You just have to pace yourself. The story is told from two different perspectives, alternating between two girls. First we have Amber, a girl convicted for killing her stepfather. Then there's also Vee, an aspiring ballet star with too much ambition and too little real talent. Both girls have stories to tell and through their stories we also get to know Orianna, known by the public as "Bloody Ballerina" accused of killing two girls, and we find out what happened to her. This book is incredibly taunt and mysterious. There's murder, dead bodies, blood, correctional facilities, unreliable narrators, guilt, desperation, deadly ambition, betrayal, mental illness and a whole lot of top-shelf mind-fuckery. To say more about it, would be to spoil all the fun, so I'm zipping my mouth shut - read it and find out for yourself what's at the core of this beautiful mess. This book is part psychological thriller, part magical realism, and for a very long time you really can't tell what's real, what's a lie, and what's a by-product of someone's sick and twisted imagination. That's actually big part of the fun here. If you can handle the pressure, that is. The plot line is not the easiest one to follow, not by a long shot. Not only do we jump between the two girls and their version of the story, but we also meet them at different points in time (or so it seems? ), and we have to figure it all out ourselves, because nothing is spelled out or even marked with a date. It's a big blur to begin with and if you don't pay (really close) attention, you'll find yourself confused and going back to re-read whole passages. It's a challenging and demanding read, but also one worth the sweat. Once you put the puzzles together and see the whole picture, you can't help but admire Nova Ren Suma's plotting skills. The ending is beyond mind-blowing. It's ghostly and tragic and heartbreaking, but also hopeful and devilishly satisfying. Very Asian-horror-movie-like. Very atmosphering. Very powerful and affecting. I really savored the ending of this book, it's one of the best, most flawlessly executed endings ever. If you're into books that are dark and eerie, twisted and convoluted, mysterious and disturbing well, this is just the perfect book for you. It's a murder mystery with a supernatural twist and lots of grittiness. It's a beautifully written, incredibly compelling story of lies, misplaced trust, cold-blooded betrayals, justice that really isn't just at all and lives wasted, lives lost... And the moral of this story? Karma's a b**ch.